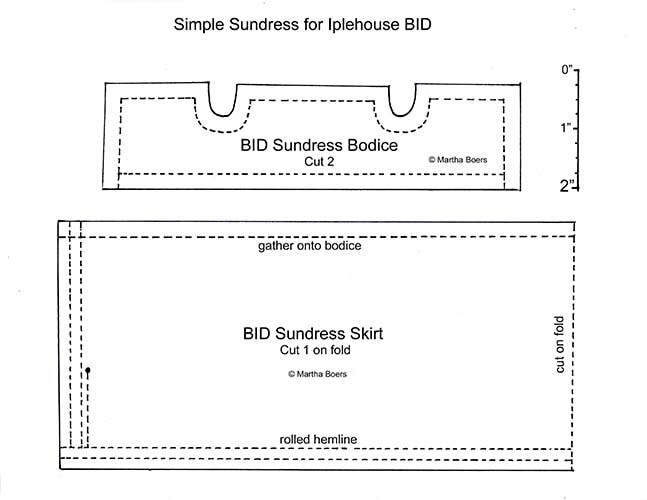 This cute little sundress pattern was designed to fit Iplehouse BIDs. 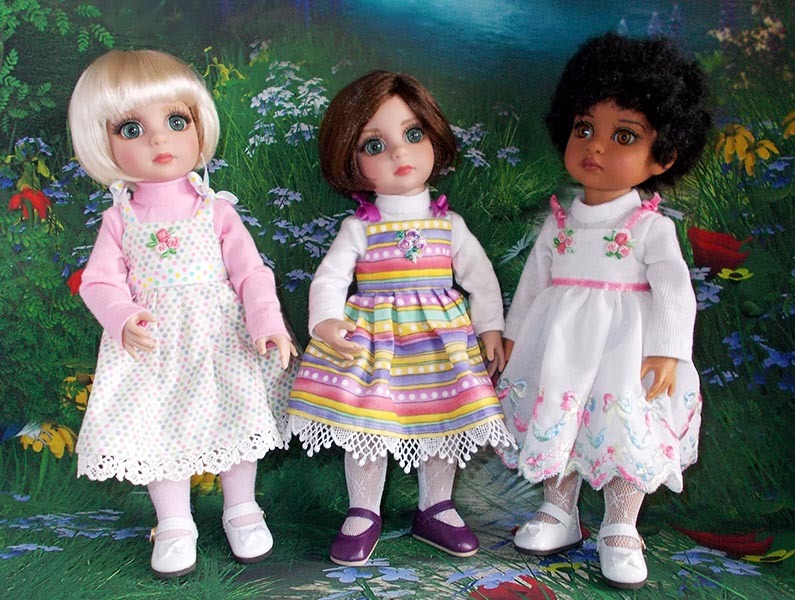 The dress will also fit other dolls with similar measurements. It's very easy and quick to make, and a good project for beginners. *Please read through all Instructions before beginning. 1. Print and cut out pattern pieces. Position onto fabric, pin, and cut out. 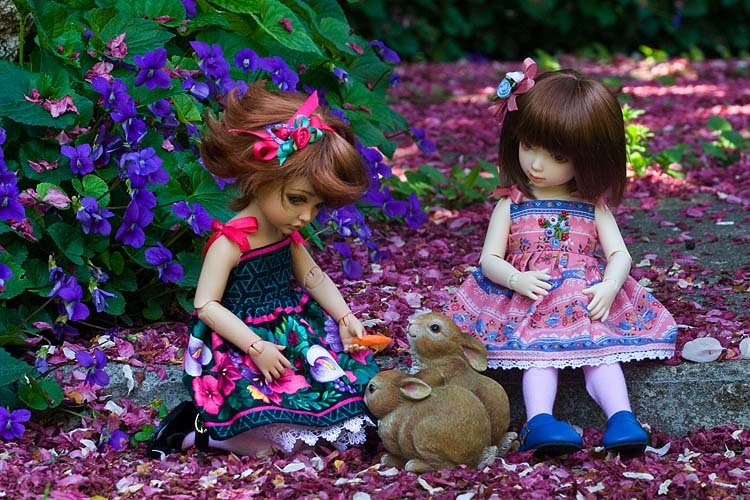 ​I used patterned stripes and a border print for my girl's dresses, carefully placing the bodice pattern to take advantage of the designs. 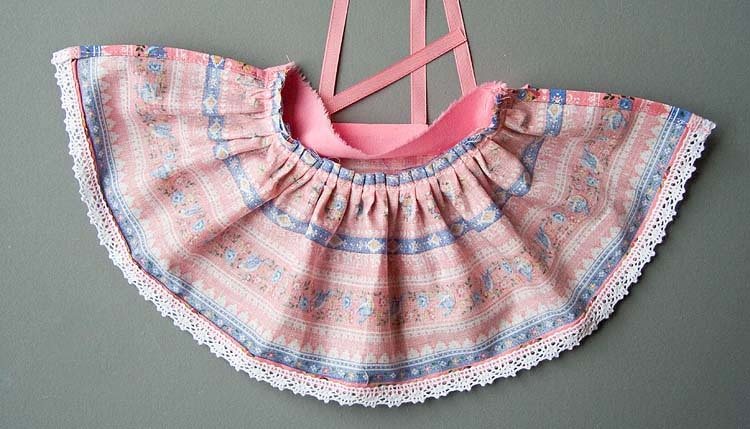 *I prefer to cut all the seam allowances off the bodice pattern and use it as a template, tracing around it onto the wrong side of the fabric with a pencil. When using this method, it's important to add the seam allowances beyond all the traced lines when cutting out the fabric. Cut four pieces of ribbon 4 1/2" long. 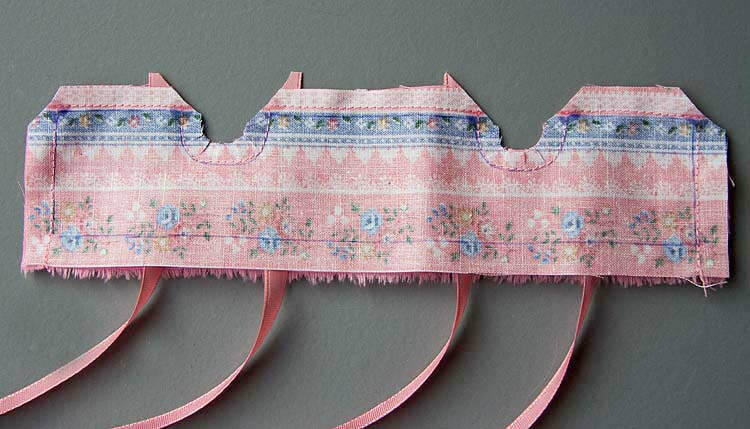 With wrong sides of bodice and lining together, position ribbons just inside corners of sewing lines on bodice as shown. Pin in place. 2. Sew around bodice edge along traced pencil line. Clip corners and armhole curves, and apply Fray Check to clipped corners. 3. Turn right side out, and press. 5. 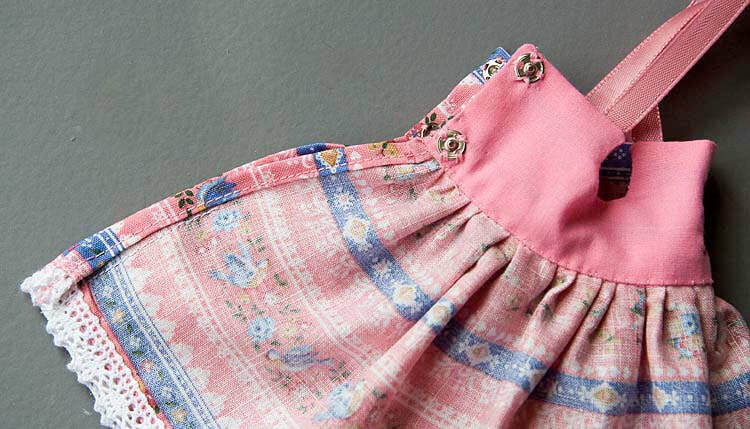 Fold lining under and pin along top of skirt edge. Sew closed by hand. 6. Sew back of skirt closed halfway up skirt. 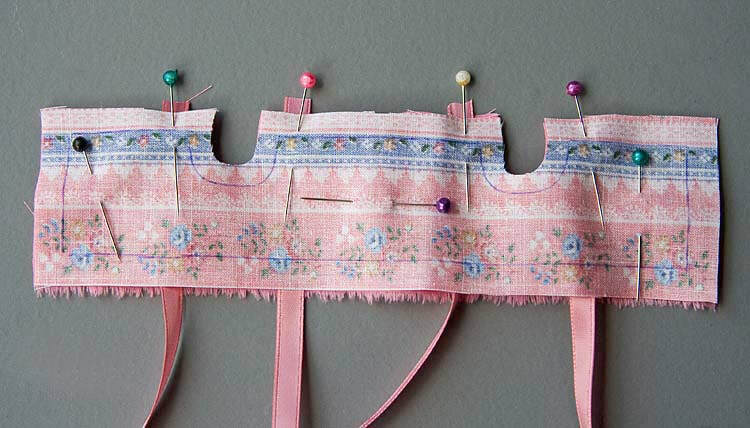 Sew snap fasteners onto bodice back. 7. Put dress on doll and tie ribbons into a nice bow. 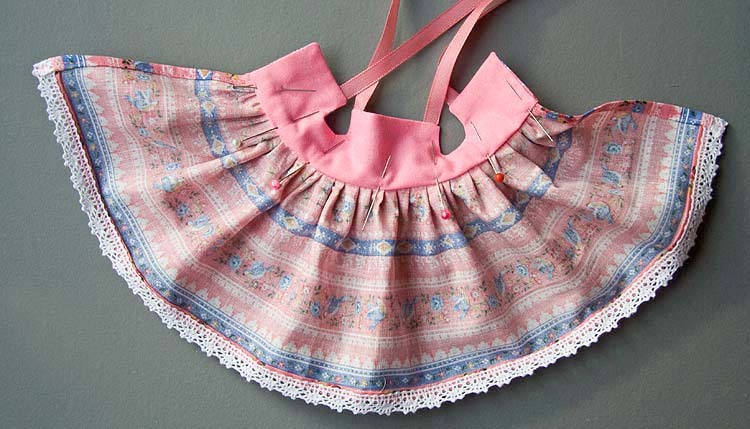 Take dress off and with matching colour thread stitch through the bow a few times to secure it so it won't come undone. Cut off the ends of the ribbons and run a bit of Fray Check over the ends. 8. 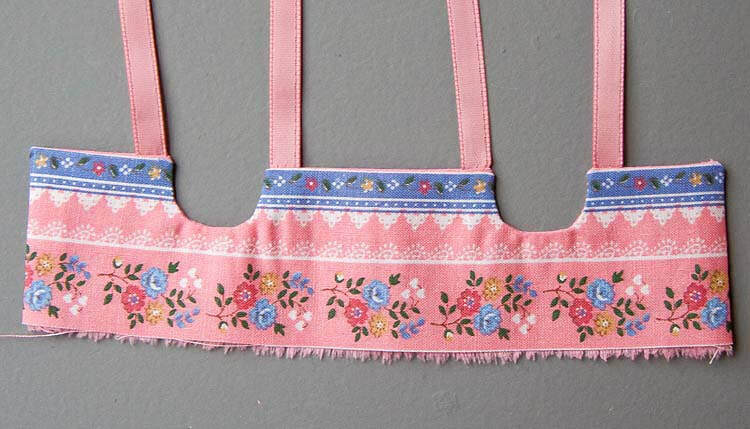 Embellish with embroidery or beads if desired.